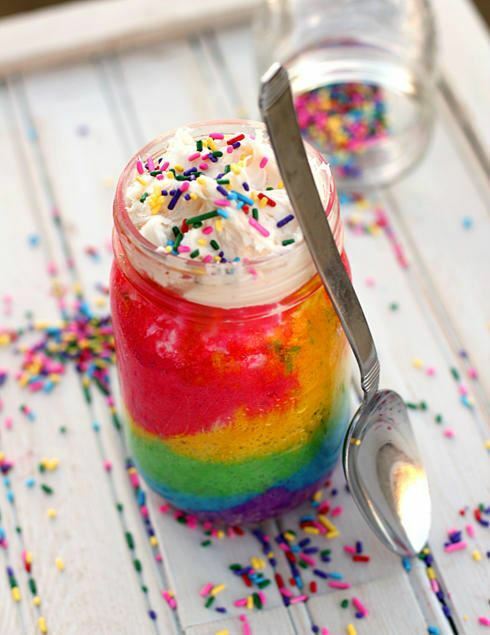 Cakes in a jar are just the cutest, and this little sweetie would be a perfect gift for people to take home – especially if you are having a rainbow themed children’s party! Here are the directions on how to make this perfect dessert from Family Kitchen. 1. Preheat oven to 350 degrees. Thoroughly wash and dry the inside of each canning jar. Spray the inside of each jar thoroughly with nonstick cooking spray. Set aside. 2. Scoop about 1/2 cups of cake batter into five small bowls. It doesn’t have to be perfect, don’t panic if you get a little more of less of one color than another. Tint each bowl of cake batter with the food coloring until very vibrant. 3. Spoon about 3 tablespoons of the purple batter into the bottom of each jar. Spoon equal amounts of turquoise batter, then green, yellow, and pink. Place the jars in a shallow baking dish, add about 1/4″ in water in the baking dish. Place the baking dish in the oven and bake for 30-35 minutes. There was a few complaints on the website that 30 – 35 minutes wasn’t long enough to cook the cake. If you are having problems cooking the cake all the way through, stick it back in the oven for another 10 minutes or so, and that should do the trick! 4. Remove jars and allow to cool completely before scooping a small portion from the top of your cake and adding a hefty dollop of vanilla buttercream to the top. Sprinkle & serve, or cover with a lid and store in the fridge until your party! Thanks for writing this resource within your site.